Aussie Natural > Blog > How are natural springs formed? How are natural springs formed? Humans have depended on natural springs for centuries – both for sustaining life and agriculture. Cities, towns and settlements all tend to be located near a reliable source of groundwater. A natural spring is a special type of groundwater source where pressurised water emerges from the ground in a steady flow. All natural springs are the result of an aquifer which consists of an underground area of rock and other materials such as gravel, sand or silt. The Darling Ranges is one of the most prominent locations of such aquifers. The water table is essentially the top level of an aquifer, which may change due to increased rainfall or underground movement. When the water table reaches a high point, the surface water increases in volume and seeps out of the soil. However, there is only one particular type of aquifer that will produce a natural spring. This is known as a confined aquifer, in which the water table rests at a higher point to the outlet. When a confined aquifer is at a lower level to the water table, the water cannot rise up and is thus pressurised. If an outlet to the surface is nearby, the water will flow upwards and spout out of the surface. This is how a natural spring is created! Many forms of bottled water are simply treated to remove impurities but water from natural springs is seen to be more beneficial as the spring water is naturally filtered and purified through the earth. It is also important to note that spring water and mineral water are not one in the same. The latter contains higher levels of elements known as total dissolved solids. For those who prefer traces of pure minerals without significant alteration to the taste, spring water is a more attractive option. At Aussie Natural, our spring water comes straight from the heart of the protected aquifers in WA’s Darling Ranges. 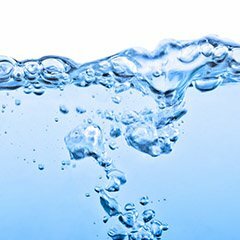 We provide a wide range of natural spring water products including bottles, water coolers and water filters to suit the needs of individuals, families and businesses. To learn more about our products call us on 1300 360 332 or enquire on our website.